Here is a sunflower I found along the road to Clingmans Dome last week. 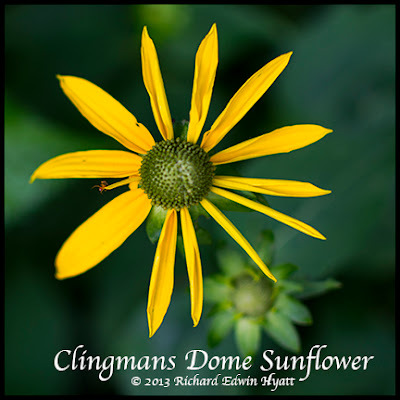 I don't know which variety it is so I will just call it Clingmans Sunflower for fun. Friday night we went up again and climbed the trail to the tower on Clingmans Dome. All along the trail were Clingmans Sunflowers with just the center part. A very few had yellow leaves. As the days pass this week I expect the yellow petals will sprout and make a photographers field of dreams come true. All the month of August these should be in full bloom if the history of years past holds true.